Once you’ve installed the Posts Table Pro plugin and chosen your default settings, it’s time to start creating tables. Each table will inherit the defaults from the plugin settings page. You can override these by setting the shortcode options in each individual table – for example, to create different tables listing items from different categories. To continue configuring your tables, please see the complete list of shortcode options. The button will insert a [posts_table] shortcode into your page. You can add as many tables to a page as you like. You can also use the [posts_table] shortcode to add tables to other areas of your website (e.g. 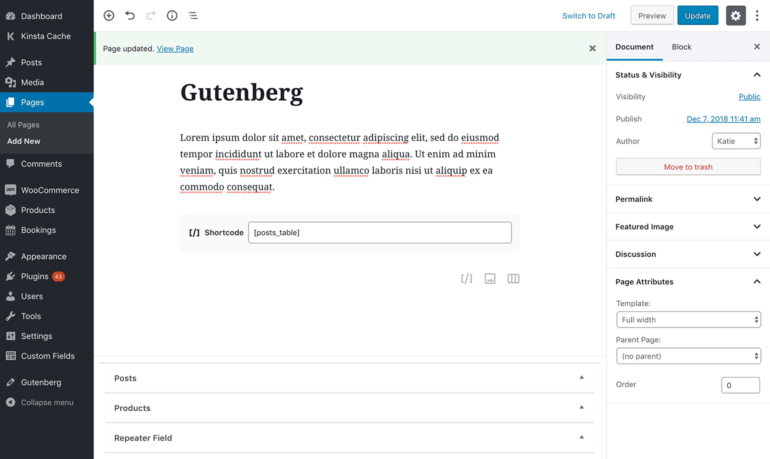 text widgets or a Text element in a page builder plugin). If you want the posts table layout to be used automatically on other parts of your site, then you can do this by editing the archive template in your theme. This is more technical and we’ve provided basic guidance on how to use the Posts Table Pro layout on category archives and search results pages. Posts Table Pro is a dynamic WordPress table plugin. This means that it creates tables automatically, containing information already stored in your WordPress database. This might be pages, posts, or any custom post type such as documents, events or members. No manual data entry is needed. If you haven’t loaded the information that you plan to display with Posts Table Pro yet, then you need to do this first. You can either add the information as WordPress posts or pages in the normal way, or create a custom post type for storing the data using a free plugin such as Pods. You can also create custom fields and taxonomies for storing any extra data that you wish to display. If you have too much information to add manually, please see our article Can I import data to display in Posts Table Pro? … Pro simply lists your WordPress pages, posts or custom post types … help you with this. Will my posts table display imported products?. The plugin … In this case, then you can import the documents to whichever … .